(NaturalNews) The makings of a mass-level extinction event in the world’s oceans appear disturbingly imminent, as marine species after marine species washes ashore on the Pacific West Coast. 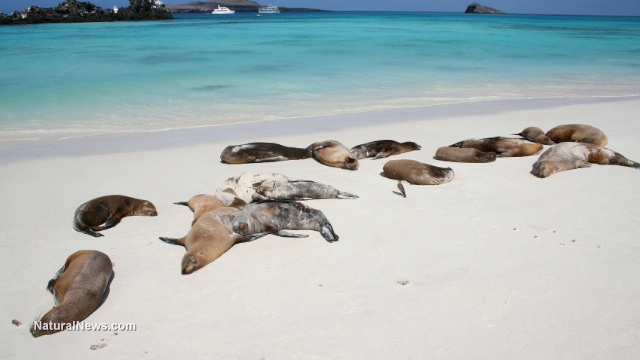 Ailing seals, dead fish, missing pelicans and much more are being reported in the media as scientists struggle to figure out what, exactly, is causing entire marine ecosystems to suffer and die, seemingly inexplicably. Much of the carnage is being reported in California, where baby sea lions in distress have been washing ashore in record numbers. The Wall Street Journal (WSJ) reports that, for the second year in a row, more baby sea lions than ever are having trouble surviving after being abandoned by their mothers, the direct result of a lack of food. According to reports, a record 367 California sea lions were admitted to the Marine Mammal Center near San Francisco between January and May, which is nearly five times the normal average. In Southern California, more than 600 sea lions, or twice the normal average, have been taken in so far this year. This is on top of the 1,600 that were treated last year. A little further north, orcas and beluga whales are suffering similar fates. The National Oceanic and Atmospheric Administration (NOAA) says widespread pollution from oil and gas drilling has caused populations of both species to dwindle significantly throughout the past several decades. Also suffering along the Alaskan coast are Alaskan ice seals, more than 250 of which have developed a mystery disease that often results in death. Experts have postulated that toxic algal growth along coastal waters may be to blame, and this a result of excess sun exposure due to continued ozone depletion. Over on the other side of the country, hundreds of manatees and about 80 bottlenose dolphins were discovered stranded in Florida’s Indian River Lagoon between 2012 and 2013. And in South Carolina in 2013, as many as 40,000 menhaden fish, which measure between six and eight inches in length, washed up dead between DeBordieu Beach and Pawleys Island, just one week after thousands of the same type of fish washed up along North Carolina’s Masonboro Island. One year prior, thousands of dead starfish washed up along the same beaches. Back in California, changing weather patterns that some scientists are attributing to the weather phenomenon known as El Nino are causing fish and whales to appear in unusual places. The first ever yellowfin tuna fish was recently caught in San Diego, as well as the first dorado Mahi Mahi fish. These fish types typically do not appear in San Diego. “We’ve already started to see very unusual fish catches here,” stated Tim Barnett, a marine research emeritus with the San Diego-based Scripps Institute of Oceanography, to KPBS. “The first yellowfin tuna was caught in May–that has never happened before to anybody’s recollection. Since these types of fish don’t normally live in the colder waters off the coast of California, their fate is basically already sealed like the rest of the dead animals that have previously been discovered. Add to this the millions upon millions of dead sea stars being identified up and down the Pacific West Coast and the world has a real problem on its hands. Whether it’s radiation from Fukushima, residual oil and chemical pollution from the BP oil spill in the Gulf, changing weather patterns, or some combination of all three, one thing is for sure — the world’s oceans are sick. And based on the way things are going, a global extinction event of epic proportions seems like less a matter of if, and more a matter of when.